PT. 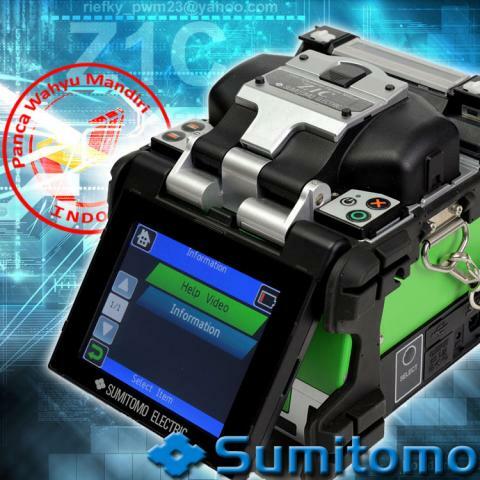 PANCA WAHYU MANDIRI adalah distributor resmi untuk alat Fusion Splicer SUMITOMO Z1C. Baru, asli, berkualitas, dan bergaransi “RESMI” selama 1 tahun. The Z1C’s heater cycle time is only Approx.28 seconds (60mm Fiber protection sleeves) and a splice cycle of only Approx.7 seconds (Quick mode), the Z1C improves splicing efficiency and productivity dramatically, thereby reducing labor time and costs while increasing project and customer service turn-up. The Z1C’s 4.1 inch LCD monitor with touch screen operation enables to confirm fiber images easily. The splicer can be operated by touching the icons on the screen. The working efficiency has improved. The Z1C has environmental protection equivalent to IP52 waterproof and dust proof. Also has anti-shock rubbers around the machine to protect the splicer from dropping. Designed for portability, precision splicing, reliability, and speed — without foregoing affordability― the Z1C splicer is ideal for splicing applications in the central office or head end, the feeder portion of the FTTx network where speed in high fiber application is crucial, and at terminals leading to the final drop to premises or home. Cari Sumitomo Z1C, Di Pawama Dijamin Paling Murah!